Pierre Wagner, Professeur des Universités at Paris 1 (Panthéon-Sorbonne), has brought out Der Raum in French. This was a long struggle, but is now brought to a triumphant conclusion, as the book was actually reviewed in the book supplement of Le Monde — the equivalent of getting it into the TLS or New York Review of Books. Pierre’s long efforts, going back twenty years or more, to bring logical empiricism back to some sort of respectability in France, are finally paying off. I won’t list his publications here (you can look them up on his website), but he’s also held a number of conferences in Paris, and, most relevantly to the current book, a fabulous two-day workshop in 2010 on Der Raum at the French cultural center on the Währingerstraße in Vienna, at which we just sat around and talked, without any papers being given at all; the main texts were the first draft of Michael Friedman’s notes on Der Raum (for volume 1 of the Carnap edition, now getting close to publication) and a long e-mail by Howard Stein commenting on some passages from Michael’s notes. Pierre was a student of Jacques Bouveresse, most recently a professor at the Collège de France, and one of the first to introduce not only Carnap but also Wittgenstein to the attention of French philosophers. Pierre tells me that Bouveresse at certain times had fifty or sixty (I’m spelling this out so you won’t think it’s a typo!) research students at a time because if you wanted to do analytic philosophy at the time, there was no one else to go to. That situation, at least (due at least partly to Pierre’s own efforts) has improved considerably! The most popular response to the Carnapian linguistic turn has not been to reject it, as Quine did, but simply to ignore it — as Williamson does, along with Chalmers, Hirsch, Eklund, and many others. Some will consider this response entirely appropriate. If the tendency of the Carnapian linguistic turn is not actually to grapple with philosophical problems but to turn away from them and change the subject, as Strawson alleges, then surely those who are interested in such problems have every right to resist the change of subject and remain focussed on the problem they set out to solve? 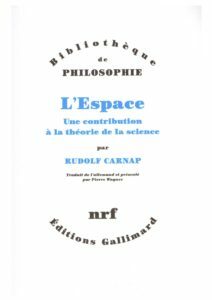 The problem for Chalmers, Hirsch, and Eklund in adopting such a view is that they appropriate certain pieces of Carnapian conceptual apparatus while ignoring, indeed defying, the larger conception (the Carnapian linguistic turn) that makes sense of those pieces, as I’ve argued in some of the posts linked above. Moreover, these authors share with Williamson an apparent committment to certain standards of rational argument and conceptual rigor loosely associated with the “analytical” tradition in philosophy with which they presumably identify, given their willingness to be associated with Carnap. Nice summary of Carnap’s play about Scipio written when he was 12 (with link to the original document); the blogger who wrote this summary credits Greg Frost-Arnold with bringing this document to his attention. Video of Carnap on German TV, from the 1960s. This was put up four years ago and has been widely linked since, so most of you have already seen it, but it’s worth linking again for the few who haven’t, as it’s the only extant video of Carnap I’m aware of. Richard Zach points out (with a nice quotation) that “syntax” started out as “semantics,” and the linguist Darin Flynn, in response, talks about Carnap’s influence on Chomsky. I had thought this was all well-known, but is it discussed in print anywhere? A talk by Steve Awodey in Paris, ten years ago, about Carnap and Saunders Mac Lane (whose last student Steve was); he must have been working on his paper in the Cambridge Companion to Carnap at the time. Includes a nice précis of our “Carnap’s Dream” paper at the beginning, including the chess metaphor (a little past minute 8). I never knew about this talk until a few days ago, so perhaps others have missed it as well.